To say that Autumn was short and sweet here is an understatement. This is the first year in the past six or seven years that I didn’t head out to Shenandoah National Park to hike Old Rag Mountain with my good friends in the hiking club. I was feeling a bit remiss for not being there and the rains kept coming down. In fact, Maryland has had so much rain that they are about to call 2018 the year with the most rain ever received since recording weather in the state. The trees held onto the green and wouldn’t let go. So much so that we began to think that they would just drop off when the cold temperatures hit with little color. Practically overnight though the color exploded in the forests, along the streams and the roadways. It was as if someone opened up their box of crayons while we slept and painted color on the trees. 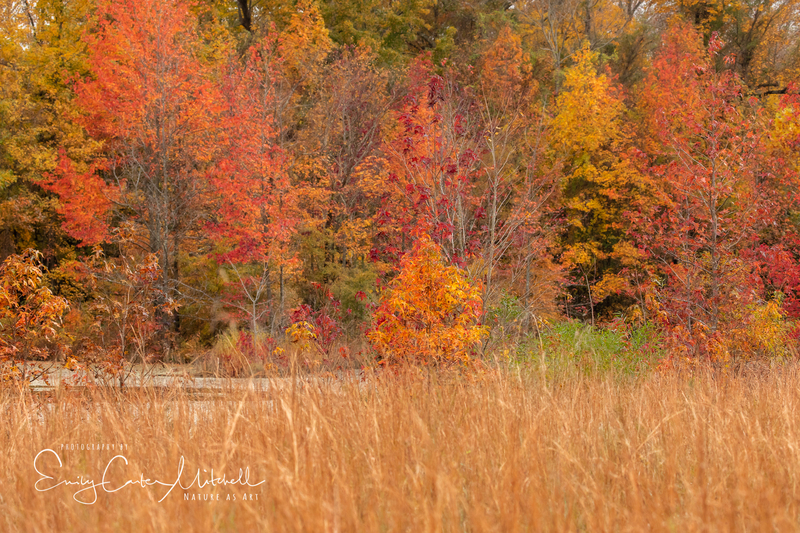 With great fortune, it was an overcast day and I decided to go and visit one of my favorite nearby places The Patuxent Research Refuge North Tract. This place is a black hole for me as it’s huge and you can drive five miles in and just barely see the place. With a wide variety of habitats including forests, evergreen trees, wetlands, lakes and ponds the scenery changes continually with each road bend taken. I kept things simple and used a 16-35mm wide angle lens with the Singh Ray Lighter/Brighter Color Combo Circular Polarizer filter on. With the low light and a tripod I was able get great depth of field with a high f-stop and use a low ISO for the best quality images. The Canon 5D Mark IV has a super feature with the live-view LCD on the back and you can engage the touch to shoot option. No longer am I searching around for a trigger switch but rather I put my camera on Live-view and a 2 or 10-second timer. With the touch-screen option I touch where I would like the point of focus to be and it begins the countdown to take the image. At each stop the colors took my breath away. I was able to slow down and really take my time to discover all of the nooks and crannies and enjoy capturing the wide perspective. At long last I was done with the big picture and switched my lens to the 100-400mm lens so that I could begin filling the frame. The Singh-Ray filter really helped to boost the color in the scene. After four wonderful hours I knew it was time for me to return to reality. 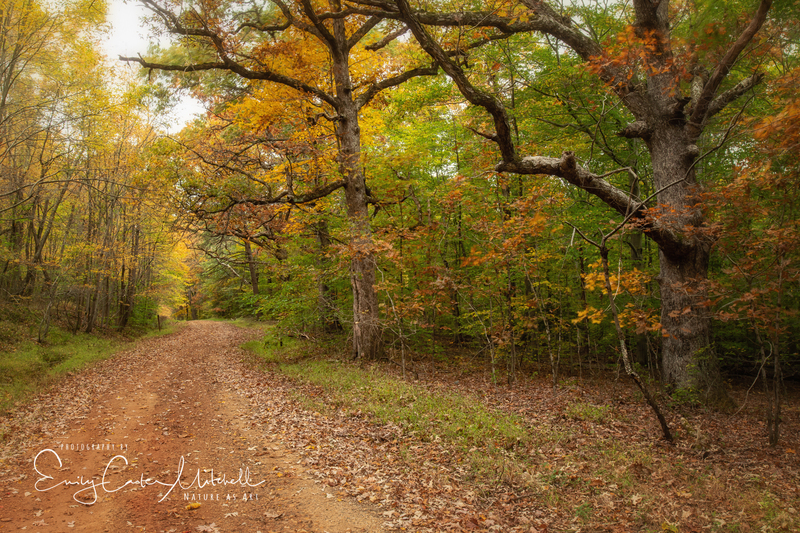 It was quite hard for me to leave as the colors and scenery were spectacular and I no longer felt like I missed Autumn by not going to the Shenandoah Mountains. The Refuge rivaled Shenandoah if not better as it is so much closer to home. And as a parting capture I stopped by the pond to see what waterfowl was there. 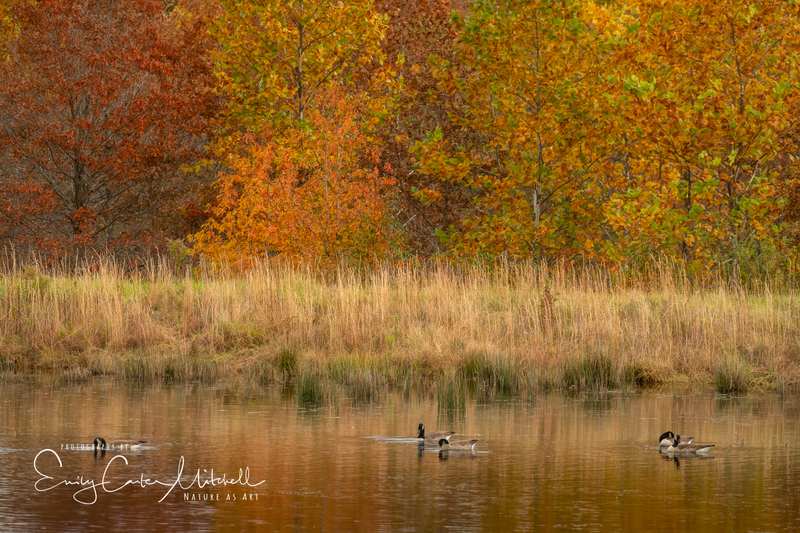 The Canada geese were kind enough to oblige and be part of the wonderful scenery. Lovely light. Thank you for bringing this to me. I hope the trees drop their leaves before the snow hits them. Some trees are still holding on here Sherry. Most of them are in protected dells. It’s nice to see. Thankyou. Truly my pleasure and there are more. I’m not surprised to hear that your autumn was short-lived in in KY. Did you have a ton of rain this year like we did? Thank you very much. The beauty of autumn well-captured, Emily! You are too kind Eliza. Thank you very much.